Buy Colgate-Palmolive products, get free stuff! You are here: Home / freebies / Buy Colgate-Palmolive products, get free stuff! Spend $15 on participating Colgate-Palmolive products, get a free travel bag with product and valuable coupons worth $25. Please allow 4-6 weeks for delivery. Available while supplies last. 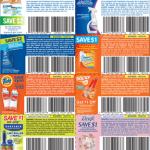 I did this last year and the coupons were great and I have loved using the travel sized items when I travel! I can’t remember if we had to buy all of the items on one receipt, but this matches up nicely with the CVS deals this week (Buy 2 Speedstick, buy 2 Colgate and you’re almost to the $15 mark). Get $13 in P&G laundry coupons + $5 cash back! Hot deal on Nabisco crackers! Thrifty Thursday: Getting items for free or close to free using rebates! That was close…my CVS receipt for that stuff was in the trash :-)!